Live Simply. Live Joyfully. Live Faithfully. I miss this place! And no, this is not a paid advertisement. I’ve availed of their services twice and I intend to visit again when I’m in Manila and try their other services. 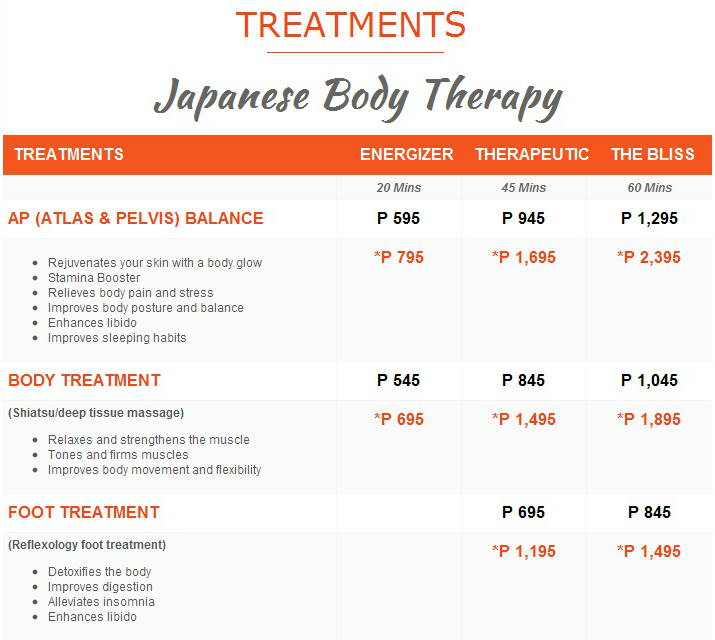 I first saw Karada in Boracay and got so intrigued, but I didn’t yet visit it and just opted for other massage places there. A few weeks later, my sister recommended this place in Mall of Asia, where they cracked her neck and aligned her body. Wow! I was sold. It was on my to-do list on my next Manila visit. Photo grabbed from Karada website. Karada SM Mall of Asia branch. Upon entering, they first let you fill out a form and questionnaire on your physical condition, concerns and reason for the therapy. I didn’t really have any particular body aches and pains, but I put down “headaches” and “digestion” as my main concerns. I tried the AP (Atlas-Pelvis) Balance for 45 minutes and it was the best! I was assigned a male therapist but it’s okay. He was very professional and would explain each process that he would do, especially when he needed to get into my personal space, like grab my whole body with my arms crossed over my chest to crack my back. Next, they lead you to changing rooms with provided black tshirt and pants to change into. I’m happy to say that the changing rooms and washroom next to it are very clean, with liquid soap, tissue and other hygiene products available. Clothes and personal items are then placed in a basket which will be placed under your bed. Aligning my body. I was told that I was misaligned, that I was leaning towards one side of my body. He showed this to me by raising both of my legs up and putting my ankles side by side. It looked like one of my legs is longer than the other, but it’s not; it’s just misaligned. This could be the result of habitually standing on one leg more than the other (sabay hands on hips, taray pose hehe), or crossing legs while sitting (didn’t we learn the “royal” way to sit in “Princess Diaries”? ), or sleeping on one side (yes, I’m a side sleeper). The therapist did a series of massages then ta-da! Hindi na ako tabingi hehe. Use of mechanical bed. Results of my APEs (Annual Physical Exams) throughout schooling revealed that I had a mild lumbar scoliosis (doesn’t everyone have some form of scoliosis nowadays?) Yes, bad posture. The therapist didn’t need to see x-rays. He felt the curve of my spine and knew. The mechanical beds are placed in another room. Makes sense because it’s so noisy when operated. It’s a bed divided into several parts that can be elevated or lowered mechanically. He did a series of up and downs with the bed then ta-da! Hindi na ako kuba hehe. Cracking my neck. On my own I’m able to crack my neck. But this brings it to a whole ‘nother level. It’s done so suddenly that you’d just be surprised with the “crack” sound and immediate relief to your neck. If you get squirmy when other people crack their neck, then you’re in for a surprise. I love it *cracks neck*. I was told that it’s the release of built-up toxins that produces the cracking sound. Overall, it’s an amazing experience and like I said, I went back for a second treatment. Although on my second time, I didn’t crack as much (huhu! Noticing this, the therapist really put effort to “crack” me but to no avail) but that’s a good thing because it means that I’m well aligned and there’s not much built-up toxins. Yey! Price. Both times I tried AP Balance Therapeutic (45 minutes) priced at Php945. I say this is value for money as it is NOT your ordinary massage. This is a wellness and chiropractic therapy. My brother-in-law, who has a spine injury, has consulted with a chiropractor for a lot more money (professional fees, of course) and they did the same thing! So if you’re feeling aches and pains and ready to try something different, try this one out. I recommended this to my friend whose back hurts once in awhile and she loved it too! She said, her spine never felt so relaxed. Let me know how it goes for you. Karada at Mall of Asia is located at the new wellness zone north wing. Contact numbers +639175488872 or +639271377045. Open 11am to 9pm everyday. It’s first come, first served. Or call for reservations. Click here for list of other branches. UPDATE (June 20, 2018): This is a late update. My last visit to Karada was last December and it wasn’t what it used to be. They had rotated the therapists and the ones we were used to in the MOA branch were no longer there. I found them to be quite noisy as well, yes it’s an open area, no cubicles or curtains, but there used to be a hushed tone about. But that time, the therapists were talking among themselves. I don’t really need to hear if they’ve filed their overtime or leaves already. Also, ten minutes into the session, my therapist was already upselling me into this and that package. Couldn’t she at least have given me the hour to enjoy and feel serene? Clearly not. So no, I didn’t enjoy my last visit to Karada. For that price and reputation as a Japanese brand, I had expected more. I haven’t been back since. There’s this one night in Shanghai, that for awhile when I thought about it, sent chills down my spine. He was handsome, tall and surprisingly funny. I was late for dinner. It was a casual night with two of his friends. When I sat down to join them, he informed me that one of his friends only spoke Chinese. Sure, I can hack that. So we chitchatted, codeswitching every now and then. Til finally he told me that his friend can actually understand us in English and Filipino! I was mortified! I squeezed his knee so hard. He paid for my dinner as a sorry gesture. We talked while walking. And if my signals were spot on, I believe he flirted with me a few times. At the club, we danced for awhile. He grabbed my hands while dancing but I felt weird so I dropped it. The night went on and we danced with other people. After awhile, I stood at the side just watching the crowd. He came by my side and asked if I was ok. I lightly leaned my head on his shoulder and said I was tired. And with the sudden gush of the crowds, we were squeezed tightly. I took his hand around my waist and he held me. We were wrapped in an embrace. It’s that typical scene when your heart feels like it’s about to burst and you’d like nothing more than to pause this moment forever. I must have played that scene in my mind a thousand times. I saw him briefly the next day. We talked on the phone a few times. Texted a few. But that was it. I flew back to Manila and he remained in Shanghai. Six months after, as destiny would have it, I saw him again in Manila, in church, serendipitously sitting at the same row I was. He already has a girlfriend, I learned at dinner before the church activity he invited me to. I almost dropped the chopsticks in my hand. I was crushed. Heart shattering into a million pieces. I asked God, why? WHY?! Why even bring him back to my life now?! This story doesn’t completely have a sad ending. When I got back to Manila, I wanted to join a bible study class because he was doing it. One of the phrases I commonly use, I heard him say: Where the Lord leads, I will follow. I was surprised to meet a man who had the humility to know that he needed God. I thought, here’s a man I could respect. That’s when I knew I wanted a godly husband for myself. I believe God used him to water the seed in me. Not for the purposes of introducing me to my future mate but to lead me to Him. That one night impacted me for eternity. It does have a happy ending. My heart broke but Christ picked up the pieces…every last one of them.